Ministers "misinterpreted" research they cited to justify axing education grants for low-income English 16-19 year olds, the study's author has said. The government axed the Education Maintenance Allowance of up to £30 a week, saying 88% of money spent on it was ineffective or "deadweight cost". But Thomas Spielhofer, who led the study on which the claim was based, told MPs this was a misinterpretation. The government said its decision was not based on just one study. The £560m EMA scheme provided means-tested grants to help young people stay on at school or college. Students protested when ministers scrapped the scheme and replaced it with a £180m bursary fund to be allocated mainly by colleges, which it said would be better targeted at the poorest students. The government has frequently cited Mr Spielhofer's study, done for the National Foundation for Educational Research, in defence of its decision. 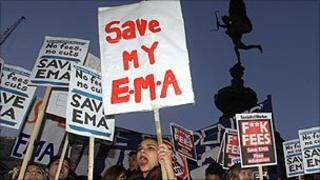 The study questioned 2,029 students, of whom 838 said they received EMA. When asked whether they would have remained in education or training if they did not receive EMA, 88% of the 838 said "yes", while 12% said "no". Giving evidence to the Education Select Committee, Mr Spielhofer said: "You can interpret that in different ways. You can interpret it quite negatively, and say that for 88% that was wasted money, but I don't actually see it that way, I think it has been misinterpreted in that sense." He said that for some of the 88%, the EMA payments would have "made no difference", but for others, finance would have been a consideration, and the fact that they would have stayed on showed "resilience". Asked whether he was "happy with the concept that EMA has a deadweight cost of 88%", he said "no". He also replied that it was "completely correct" when asked if he was unhappy that the change in government policy had been based on his research. A spokesman for the Department for Education said the decision to replace the EMA with "a far more cost effective and targeted scheme" was "not made on the back of one survey". "There is a range of evidence which shows that the bulk of the money was not getting to those who most needed it and that initial gains in participation had reached a plateau," the spokesman said. "We can no longer afford the luxury of paying substantial incentives to young people who would have stayed on anyway." The Conservative Party pointed out that Mr Spielhofer's report also said EMAs should be targeted at the young people most in need. In a report in December, The Institute for Fiscal Studies said its own estimates were consistent with an 88% deadweight cost, but argued that these costs were "completely offset" by the benefits of the policy. They also argued that there may be further benefits of receiving EMA for those who would have continued in education without it, such as improved attendance, or more study time for students who did not need to top up their income with part-time work. The University and College Union said the government had "clearly cherry-picked one statistic from one report in order to justify scrapping an entire system of financial support for young people". It said the EMA made a "huge difference in keeping young people in education". James Mills, leader of the Save EMA campaign, said the government had "corrupted the evidence to pick the pockets of the poorest teenagers in this country during the worst possible time". He called on the government to produce their evidence for scrapping EMA "as this report was the cornerstone of their entire argument". Shadow education secretary Andy Burnham said: "These damning comments demolish the entire basis of the government's justification for scrapping EMA. "[Education Secretary] Michael Gove needs to learn to listen and think twice before pursuing an ideological agenda that flies in the face of all the evidence about what works," he said.